Bira 91 Launches Slick New Cans! 27 January 2017, Bira91, the home-grown brand that has revolutionised the beer experience with its single-minded focus on great products & innovative marketing, has introduced slick new cans that will capture the imagination of beer lovers around the country. Designed for the urban millennials, the playful look of these cans make a unique style statement, which is true to the brand’s playful personality. 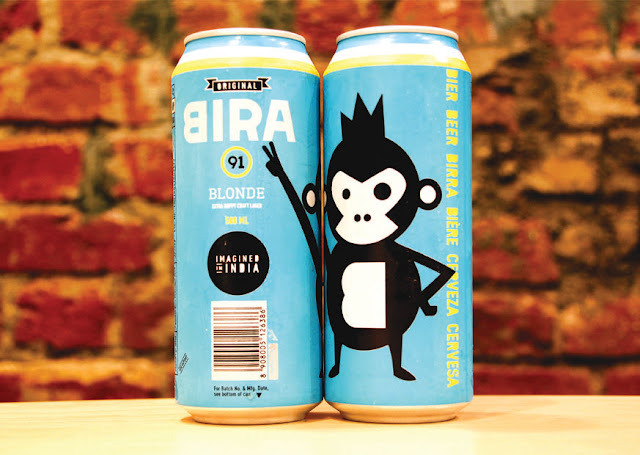 Bira91 promises consumers the same fabulous taste of their two popular variants –Blonde & White with the launch of these cans. Inspired by on-the-move lifestyle of consumers, Bira 91 cans flaunt a quirky look that is easy to stock & carry and looks great. These cans are 100% recyclable which adds to the environment friendliness of this packaging format. The cans have been launched in a 500 ML size, which makes them perfect for stocking up & staying party ready. Crafted with passion and a vision to revolutionize the Indian Beer Market, the millennia’s favourite beer brand Bira 91’s new offering stands out distinctly amidst the staid & boring designs that we have so long endured, with one thing unchanged – their unique taste. Availability: The cans are currently available in retailers across 3 cities – Delhi, Mumbai & Bangalore, with selected bars also stocking the products. Bira 91 - a craft beer brand ‘Imagined in India’ was founded by CEO Ankur Jain, is revolutionising the beer market. Established in 2015 by B9 Beverages and headquartered in New Delhi, the beer is available in two variants—Bira 91 White and Bira 91 Blonde—in draft, canned and bottled formats. About B9 Beverages Pvt. Ltd. Founded by Ankur Jain, a computer scientist by training and a serial entrepreneur, the firm is led by a young, energetic and aggressive team. The overall team has grown from 30 people in the beginning of 2015 to 300+ (March 2016).